Dozens of leaders from parish, district and county councils across East Suffolk met on the 23th January for the Sizewell C community forum held in Stratford St Andrew to discuss the latest proposals for the proposed nuclear power station with the project team. The meeting follows the final public exhibition which was held earlier this week in Trimley St Martin with the formal consultation period continuing until 29 March 2019. Over 4,000 local people have visited one of the 14 exhibitions which launched on 4 January. The community forum heard from Sizewell C project development director Jim Crawford about changes to the proposals since Stage 2 consultation covering key areas such as transport and environmental mitigation. – Road-led – a new Sizewell link road from the A12 to the B1122 and a freight management facility to the east of Ipswich, along with two train a day to Sizewell Halt or a new rail siding throughout construction. The new Sizewell link road would reduce traffic on the B1122 by 90% at peak construction in Middleton Moor and Theberton. The drilling of the piles over the 12 month construction period would cause sustained noise and vibration impacts likely to have significant effects on marine mammals and fish. The southern North Sea is a protected area for harbour porpoise (a candidate SAC) and protected bird species prey on the fish. Additionally, as the jetty would need to be in place for 8 to 10 years it would act as a groyne – causing sediment build up and potential for erosion either side. Community Forum Chairman added that the feedback received from this round of consultation would be shared at the next forum in late summer. Stage 3 consultation for Sizewell C will run for 12 weeks from 4 January to 29 March 2019 and will include 14 exhibitions across East Suffolk. 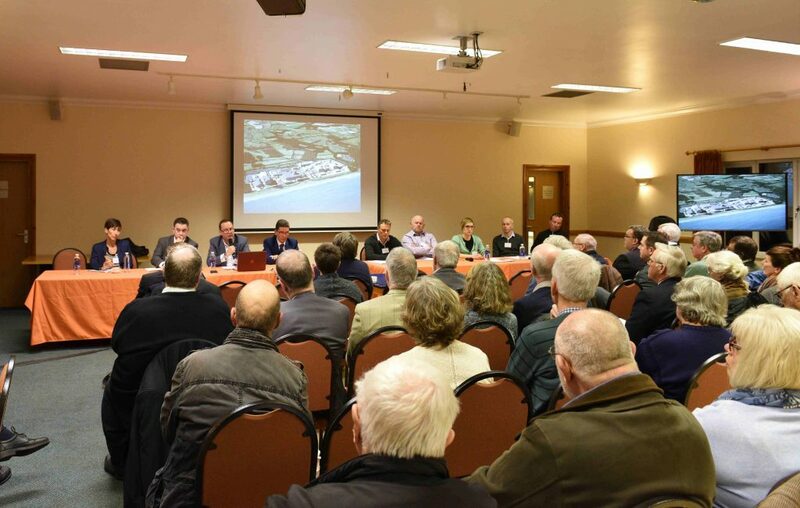 EDF Energy established a Sizewell C Community Forum for the discussion of local issues during the planning process between EDF Energy, elected representatives of the local community and other stakeholder groups on the proposed development of a new nuclear power station at Sizewell. Brian Stewart, former chief executive of the East of England Regional Assembly, is the independent chairman of the Community Forum.